Passport for Travel from Louisiana to Matagorda, Texas. Issued in New Orleans on November 21, 1836. Printed form, approximately 16 x 9 3/4 inches. Tarlton Special Collections has a significant collection of early Texas Republic materials which help support scholarly research and teaching on the relationship between the United States and the Republic of Texas. This 1836 passport is a fine example of a rare printed passport form used by states before 1838. 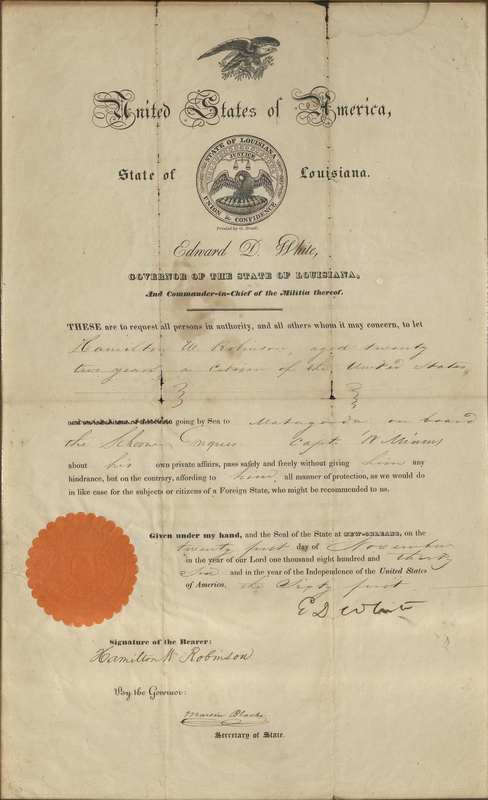 State issued passports from the state of Louisiana are extremely rare. They became obsolete in 1838 when responsibility for issuing passports was transferred from the individual states to the State Department. This passport was issued less than a year after the birth of the Republic of Texas on March 2, 1836, and before its official recognition by the United States in March 1837. Therefore, the passport authorizes travel "by sea to Matagorda" but does not mention Texas specifically. The port town of Matagorda is the third oldest town in Texas. It was established in 1827 when Stephen F. Austin obtained permission from the Mexican government to build a town for incoming settlers. The passport was issued to Hamilton W. Robinson, a New York lawyer hot on the trail of a crooked banker he had traced to Texas. 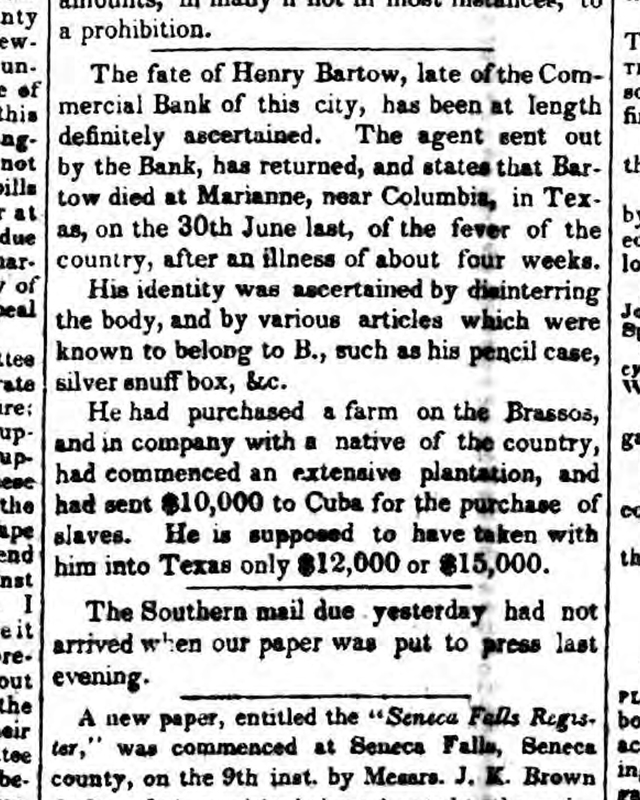 Robinson was chasing Henry Bartow, who had brought the Commercial Bank of Albany to the brink of ruin and then fled to Texas to escape his debts. Robinson's investigation successfully traced Bartow to Texas, but Bartow had died soon after his arrival in the new republic. Robinson was tasked with disinterring his body and returning it to New York. Tarlton's Special Collections Department is pleased to welcome curious visitors who would like to explore our Republic of Texas materials.